Blueberries can easily be substituted for Saskatoon berries in most recipes (and vice versa). 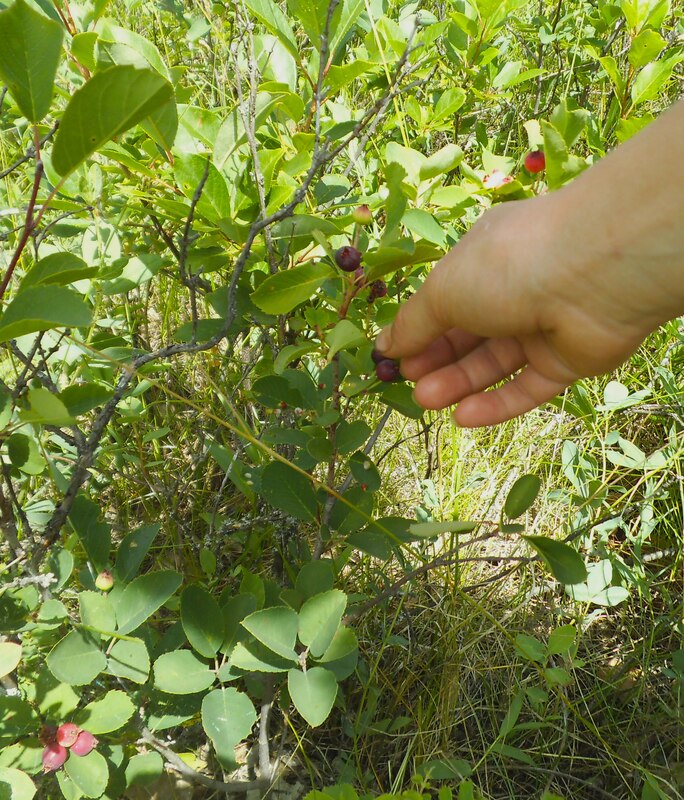 We now live in an area of the Canadian prairies where Saskatoon berry bushes are commonly found. They taste to me like a blend of blueberry and cherry flavours, with a lower juice content, since they are a relative of the crab apple. A moist spice bar turned out to be the perfect match for these purple prairie berries. Preheat oven to 350 degrees F (180 C). Cream together margarine (or butter or oil) and brown sugar. Blend in egg. In a separate bowl, combine dry ingredients. Stir dry mixture into wet ingredients. Fold in berries. Into a greased 2 quart square or rectangular baking dish, pour batter and spread out evenly. Bake for about 25 minutes, or until middle of pan tests done. Be careful not to overbake. Cool bars in the pan. 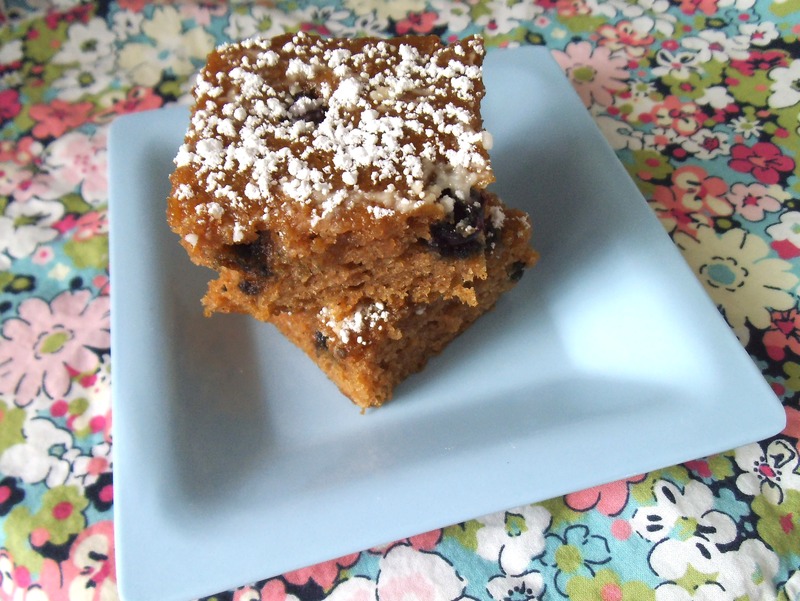 Cut into squares or rectangles and dust with powdered sugar just prior to serving. Makes about 12 cake-like bars. 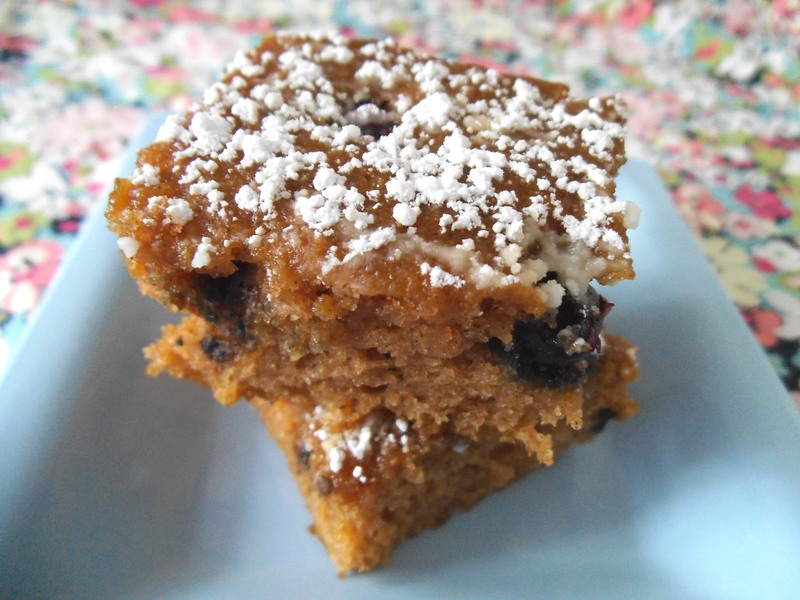 This is my first time hearing about saskatoon berries… OMG, your applesauce bars look moist and ‘perfection’. I hope you get to try them! They are delicious even without the berries. These look good! Now I know what a saskatoon berry is! I bet they are delicious. This looks lovely & seems so delicious. I am sharing with a shout out on the site tomorrow to your recipe. Thanks for sharing it with me & the other readers. Hope to try it someday! Getting others to try the bars eventually is my goal. They’d be lovely with blueberries too. I was delighted to discover and explore your site recently. Thanks so much for highlighting the recipe! I have never heard of the saskatoon berry but I would love to try these with blueberries. They look really delicious and sound healthy. Thank you so much for linking up to Saturday Dishes Snacks. Saskatoon berries are native to the Northwestern U.S. and Western Canada. My mom used to pick them here as a child, but I never encountered them until she bought me a can of Saskatoon berry jam. I’ve been hooked ever since. Interestingly, people here either love them or hate them. But blueberries are something we can all agree are delicious!